Tendons are flexible bands of tissue that connect muscle to bone inside the human body. Undoubtedly the most well-known tendon is the Achilles tendon, which travels about 6 inches to link the calf muscles (gastrocnemius, soleus) to the heel. It is the thickest and strongest tendon in the body, and for good reason: walking places stress on the Achilles equal to multiple times the individual’s body-weight, while running elevates this stress even further! This is just one of the reasons that the Achilles tendon is amazing. Here’s another reason: it makes moving easier and more efficient. Each step we take stresses the Achilles, causing it to stretch. Since it is flexible the tendon works like a large elastic, storing this energy and then releasing it when we push off with our planted foot. Computer simulations have estimated that it reduces the energy cost of running by up to 75%. Fun fact: in Greek mythology the goddess Thetis dipped her son (named Achilles) into a river that granted immunity to injury, but she held him by the heel while doing so. As a result, the boy’s heel didn’t touch the water, making it vulnerable and leading to his demise. This is the origin of the “Achilles heel” and thus the Achilles tendon. 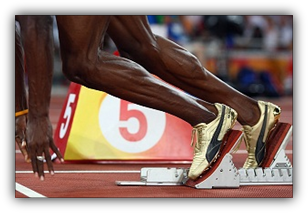 Achilles tendon length is directly related to maximum vertical jump and sprinting speed. Think of it this way; the longer an elastic the more energy it can store, meaning it can snap back to its original length with more power compared to a short elastic. When an athlete stretches their Achilles by pressing their foot into the ground (i.e., immediately before a jump or while planting a foot during sprinting) those with longer Achilles’ will have an advantage because they will “spring back” with greater force, resulting in a higher jump or more speed. Look up pictures of an NBA player’s calves (or check out Usain Bolt’s calves at the top) you’ll see what I mean; their Achilles tendons are incredibly long!